The World of MMA is far from a young man’s game. Whilst the energetic, testosterone filled youngsters can make serious waved through the fight fighting fraternity, many others don’t reach maturity until their late thirties when their battle-hardened bodies are able to take and dish out severe punishment that only comes with experience. But 53 year of age is sure pushing things a bit! But Tim Karaker is a bit of a different story. The epic father jumped into the cage on an hour’s notice back in 2012, but there was a further twist: he was to fight his son. Now a good father teaches his son how to defend himself and fight like a man, but never fights him seriously. When the rules call for it, and the two men touch gloves, all bets are off and family ties are severed to make way for animosity and survival. Tim, fighting for just the third time was very gracious in stepping up to take the fight, and his son must have thought he could outmaneuver the old man, but think again! Karaker was able to weather a serious storm and deliver his own heat in return. Things did look ominous early, however, with his son getting a mount. Karaker was able to escape before turning the tables. Eventually, his son tired out and the upper hand was gained by the 53-year-old. He was able to knock the young man down before getting to the ground and pound. 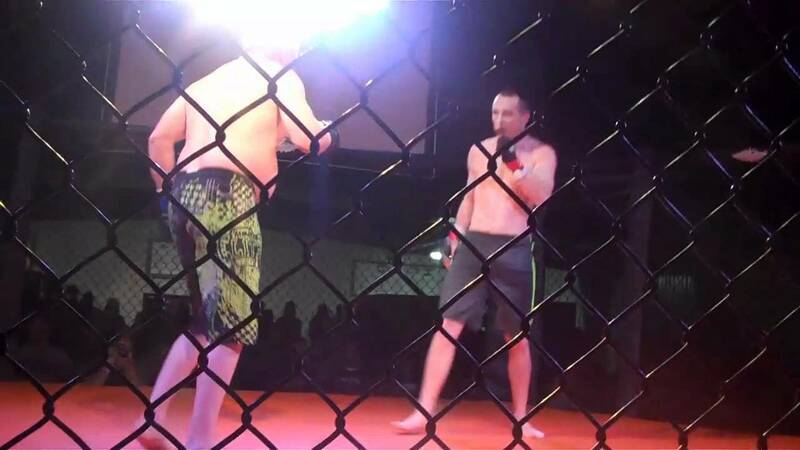 The ref waved off the fight before things got too nasty.